Everyday farmers make decisions that affect their bottom line. Being a conventional farmer, I make decisions all the time regarding which chemicals to spray based on what the fields need and what they don’t. But it’s not as simple as you may believe. There are many factors at play, and this week I experienced just how complicated it can be. Matt and I were out walking our green bean field that is due to be harvested this week. While walking around, we noticed a good amount of spring wheat sprouting. This wasn’t too surprising since last year the field was planted with spring wheat; these were “volunteer” plants growing from residual seeds left over. We had both seen the wheat before, but figured that it wasn’t a big deal given that the harvesters would have no problem cutting through the thin stocks. So, in our minds there was no issue. 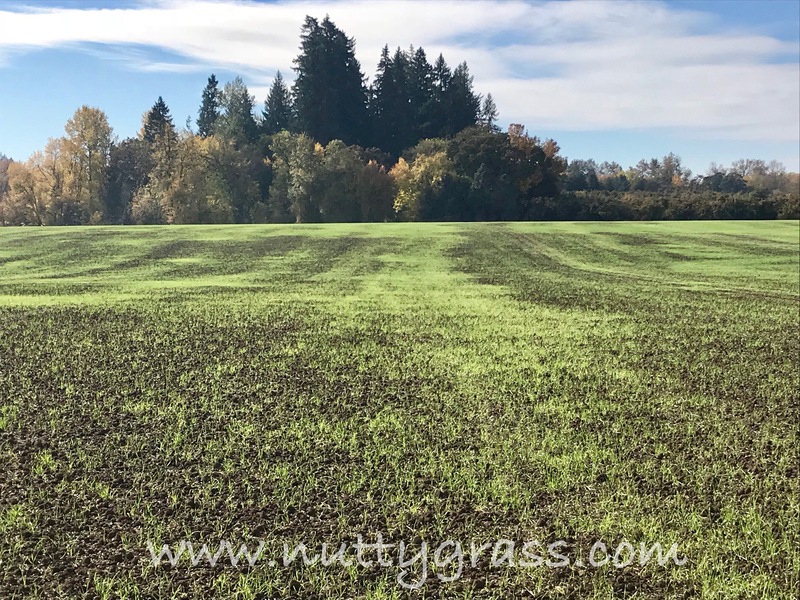 The grassy looking crop is the spring wheat that has volunteered in the green bean field. Unfortunately we were wrong. After consulting with our field man, we were told that wheat is a huge issue because of allergens that could move from the field to the processor and eventually to the end product. I have to tell you here that this never even crossed my mind, but I’m sure glad someone mentioned it to us! If there is wheat found in your green bean crop, the processor can reject the whole field. Yes, that’s right; you would have to just leave the entire crop right there, unharvested. As you can imagine, this would be devastating to our farm. I’ll stop here and mention that all registered pesticides have a label attached. This is a booklet that is on the jug that outlines the rules and regulations behind spraying that pesticide. This is where you go to see the order for mixing chemicals, the precautions to use when handling the product including what protective gear to wear, and how long a person has to stay out of the sprayed area. This is also where you find the “pre-harvest interval” or the amount of time required between application and harvest. Matt and I hear this as we are standing in a field of green beans that we had worked hard to raise and take care of, one that would provide healthy food for thousands of people, one that hopefully will give us a good return and one that we hoped we were done spending money on. And now we were faced with the knowledge that we could take two hours, with minimal cost in chemical, and get rid of the wheat entirely. But that would not be following the label and would essentially be breaking the law. Or we could tell all of our employees that they had to walk a field of green beans and pull wheat by hand, the cost of which would be substantial with six employees taking about four days to get this accomplished. Also taking time away from other important tasks on the farm. I say this as though it was a decision that we talked about. But it wasn’t. The only option on our farm, the only option on farms across the nation, was to pay for the labor to get the job done right. My point is that these rules are in place for a reason, and we all appreciate and respect that. While I don’t have a regulator out in my fields all the time, I still follow the rules because there is good reason for them! And it’s the right thing to do. This week, when we head out to harvest these green beans, you can bet that my kiddos will be out there right beside us, eating those green beans that are being harvested right in front of them. They will do that because the beans are safe, because we followed the rules, and because we farm responsibly, like farmers across America, to grow safe, high-quality food. Decisions made on a farm are based on continuously moving parts. Decisions made today might change if made tomorrow. Factors, such as the weather, pests, the crop, the timing of the plant itself, all come into play to make a seemingly simple decision to just go out and “dowse” our crops because it’s cheaper become incredibly complicated. I have experienced this decision many times while farming, but the answer is always very clear: It’s not just about our bottom line, it’s about safe and healthy food. Period.